Ornithomimus was an ominovorous dinosaur that lived in the late Cretaceous period, about 76 to 65 million years ago. Fossils have been found in North America and Asia. It was about 12 feet (3.7 meters) long. It would have held its body parallel to the ground, balanced by its extra long tail. 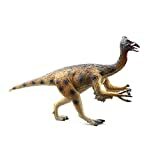 Ornithomimus was a fast runner, and could probably have reached speeds of about 30 miles per hour (50 kilometers per hour). 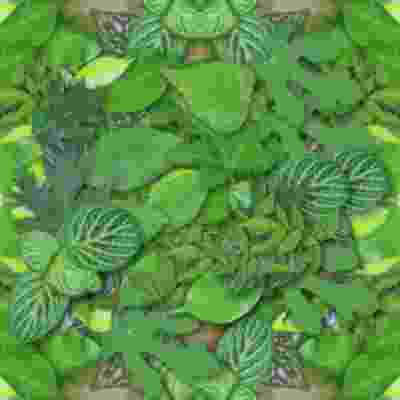 It probably ate insects, small reptiles, mammals, fruit, and leaves. It may also have raided the nests of other dinosaurs to steal and eat their eggs. The creature's name means "bird mimic" and was chosen by Othniel C. Marsh in 1890. Marsh chose the name based only on a foot and partial hand of the first species found, Ornithomimus velox. In 1933, a more complete skeleton of a second species, Ornithomimus edmontonicus was found in Canada. Asian Dinosaurs - Ornithomimus lived in North America and Asia. North American Dinosaurs - Ornithomimus lived in North America and Asia. Ornithomimus was a genus of dinosaur. "Ornithomimus" means "bird mimic". The name was chosen by Othniel C. Marsh in 1890. 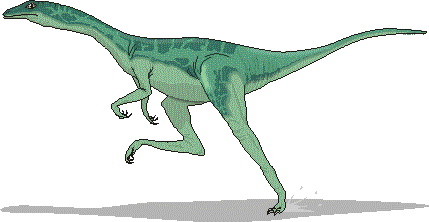 Ornithomimus was a member of the Saurischia ("lizard-hipped") order of dinosaurs. What this means, is that although Ornithomimus was not closely related to lizards, it did have similarly shaped pelvic bones. Ornithomimus was a Theropod - a member of a group of related bipedal dinosaurs that included the ancestors of birds (although Ornithomimus was not itself an ancestor of birds). Ornithomimus lived between about 76 million years ago and 65 million years ago, during the late Cretaceous period. Ornithomimus was one of the dinosaurs which died out during the Cretaceous-Tertiary mass extinction at the end of the Mesozoic Era. Ornithomimus was a omnivore (ate both meat and plants). Ornithomimus was about 12 feet (3.7 meters) long. Ornithomimus weighed about 300 pounds (136 kilograms). 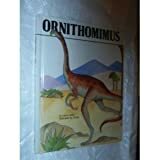 Presents facts and theories about the physical characteristics and behavior of the Ornithomimus. 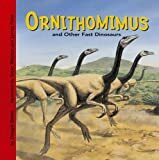 Describes some of the fastest dinosaurs that ever lived including the Ornithomimus, the Patagonykus, the Orodromeus, the Dromaeosaurus, the Saurornithoides, the Dromiceiomimus, the Zephyrosaurus, and the Avimimus. Eons ago, a bird-mimic dinosaur escaped the jaws of the terrifying predator Albertosaurus, but at the cost of serious injury and, ultimately, its life. Seventy-five million years later, scientists discovered the Ornithomimus' well-hidden, complete articulated skeleton in the badlands of Alberta's Dinosaur Provincial Park -- conclusive evidence that this little-studied family of dinosaurs is closely related to modern birds. Watch Me Read and Draw: Dinosaurs is a step-by-step drawing and story book that teaches kids how to draw 11 different dinosaurs with simple steps and a fun, engaging story. What’s better than reading and drawing? Doing them together, in the same book! The Watch Me Read and Draw book series is special because it blends two things together that kids love: reading and drawing! Each page features easy-to-follow instructions so young artists can draw all of the dinosaurs from the story, one step at a time. Basic shapes that kids will recognize make it easy to follow along and learn how to draw. The flip-out drawing pad also offers drawing prompts and simple shapes for a jump-start, making it enjoyable and fun to draw favorite dinosaurs. Plus, there’s a whole bunch of colorful stickers inside to reward them as they complete the story along the way, and a prehistoric scene at the end to make their very own! It’s the perfect starter drawing book for kids who love to read and draw. The lifelike dinosaur will be a great Gift idea. 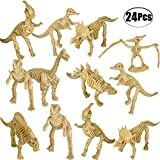 Size: 11.8"x3.1"x6.3"
PACK OF 24: Plastic Dinosaur Fossil Skeleton A Collection Of Different Styles Figures includes Pterodactyl, Ornithomimus, Tyrannosaurus, Stegosaurus, Triceratops, Corythosaurus. 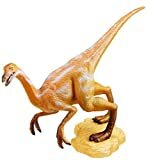 This is an 8" tall Mini Ornithomimus Dinosaur bean bag that is beautifully detailed with embroidered eyes and mouth. Ornithomimus(pronounced or-NITH-oh-MIME-us) Ornithomimus (meaning "bird mimic") was an ostrich-like Ornithomimidae, a theropod with a toothless beak, long legs, and hollow bones. This meat-eating dinosaur was about 15-20 feet (4.5-6 m) long and lived during the late Cretaceous period, roughly 76-65 million years ago. Ornithomimus woodcraft construction kit is great educational wood toy for kids and suitable for age 6 and up. This is a collections for the dinosaur 3d wooden puzzles. Authentic - discover life-size dinosaur claws developed by a real paleontologist!